Registration is now open! 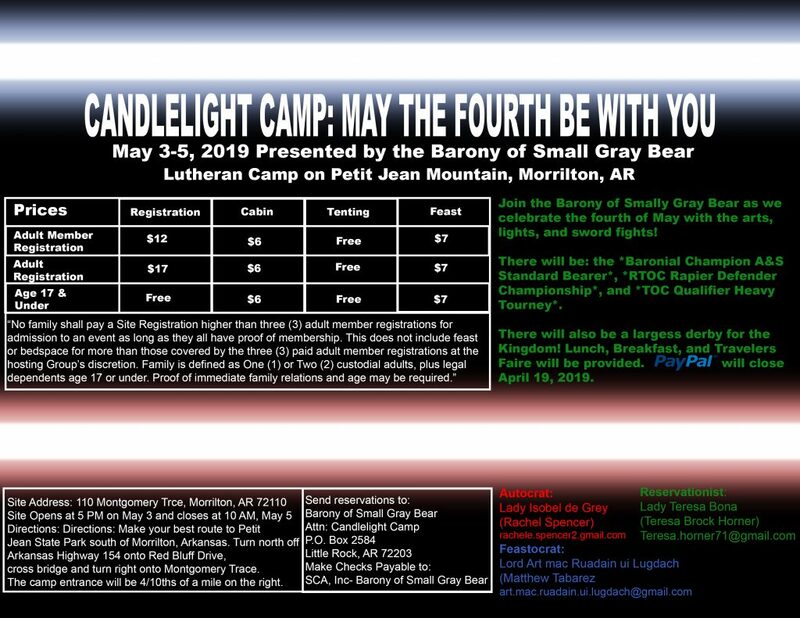 Seek here to reserve your presence, and May the Fourth be with you! The sight is discretely wet. Please, no original containers and pack out your empties. This is the recognized web site for the Barony of Small Gray Bear of the Society for Creative Anachronism, Inc. and is maintained by THL Juan Carlos Santiago y Benevidez (MKA Leif Hassell). This site may contain electronic versions of the group's governing documents. Any discrepancies between the electronic version of any information on this site and the printed version that is available from the originating office will be decided in favor of the printed version. For information on using photographs, articles, or artwork from this web site, please contact the Webminister at gro.r1555823825aebya1555823825rglla1555823825ms@re1555823825tsini1555823825mbew1555823825. He will assist you in contacting the original creator of the piece. Please respect the legal rights of our contributors.